In addition to ensuring your equipment is regularly serviced, it is important to provide evidence that it is operating effectively and controlling correctly. In order to achieve this, most customers are required to work to recognised standards such as HTM01-01 or UKAS. Depending on the standard, testing may be required on a daily, weekly, quarterly or annual basis and should be carried out by a Competent Person. LTE’s nationwide team of engineers are all qualified to HTM01-01 parts C & D and UKAS and are equipped with the latest data loggers and TQ software to enable them to provide customers with the reports of the testing. 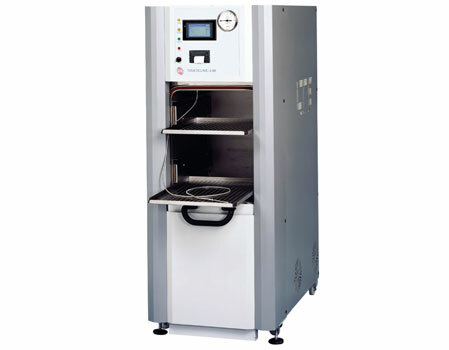 Our engineers are experienced on all leading manufacturers’ autoclaves, washer disinfectors and endoscope storage/drying cabinets. Qualified to HTM 01 01 parts C & D, our engineers can carry out service and testing, not only on LTE autoclaves and washer-disinfectors, but also many other brands. We offer microbiological testing on the endoscope cabinets and final rinse water testing on washers, as well as steam condensate analysis. LTE has been selected for the NHS Supply Chain Framework agreement for maintenance and validation of autoclaves and washer disinfectors, giving you the confidence in our ability to carry out this work. Most laboratories and research establishments are required to work to UKAS standards. LTE’s Service Centre is accredited to UKAS (ISO17025) and is audited on an annual basis by UKAS to ensure our procedures and quality system operate to their required standard. Where most other service providers are only claim that their testing is traceable to UKAS, LTE’s accreditation enables us to issue UKAS certification for our work which is signed off by our Technical Manager. Our accreditation covers temperature, pressure and time. For customers who do not operate to HTM or UKAS standards but still wish to have equipment calibrated, testing can be tailored to meet your requirements – it may not be necessary to carry out a full 12 point test, in some instances for example a simple single point calibration using a hand held thermometer may be acceptable. All LTE’s test equipment is calibrated to UKAS standards. As with all our other services, calibration and validation is available to non contract customers.